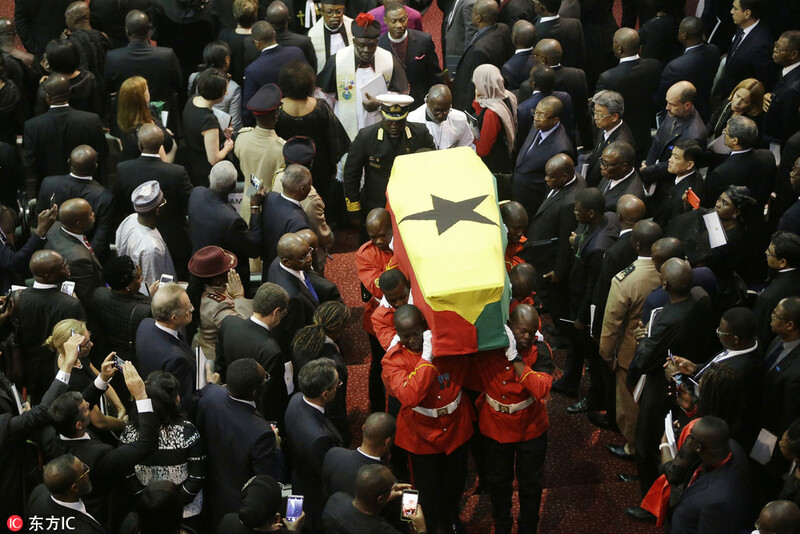 ACCRA, Ghana — United in sorrow, world leaders and international dignitaries came to Ghana to pay their last respects to the late United Nations Secretary-General Kofi Annan who was honored with a state funeral Thursday, as many lauded him as an exceptional man and leader. Annan died on Aug 18 in Bern, Switzerland at age 80. The grandson of tribal chiefs, he was the first black African to become the UN leader and was awarded a Nobel Peace Prize. "Kofi Annan was courageous, speaking the truth to power while subjecting himself to intense self-scrutiny," said current UN Secretary-General Antonio Guterres. Presidents from across Africa joined Guterres, Annan's family and many others in a ceremony that concluded two days of viewings.